One Source Equipment Rentals has trench shoring and shields available for rent or sale from Speed Shore. 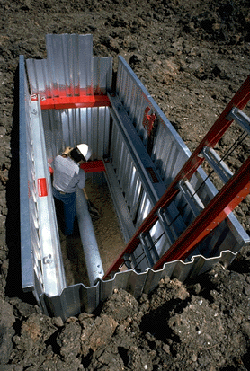 They are designed to brace the walls of the trench/excavation to prevent collapse. Once placed in the excavation, enclosed hydraulic cylinders are pumped out to shore up trench walls. This is safely done outside the excavation through the use of a hydraulic pump. These light weight solid-walled aluminum shields can be easily be placed into the excavation by a rubber tired backhoe. Ideal for utility maintenance and repair, cable splices, pipeline bellholes, vault placements, trenchless technology pits and light utility installations. Quick-connect pins allow for quick disassembly of shield and changing of Speed Struts®. Hydraulic cylinders permit precise control from outside the shield on irregular and non-uniform excavations. Can be pinned and used as a static shield. Can be stacked for deeper excavations. Call us today for all your trench shoring needs. These light weight aluminum vertical shores can be installed with or without finn form plywood depending on soil type. Various cylinders and cylinder extensions can be easily mixed and matched to suite the excavation. Designed for use in more stable soils, they can be placed as fast as you excavate, usually by one person. All vertical shores are installed and removed from above-ground, thus avoiding dangerous exposure to unshored trenches.